Racing Around tells the story of three siblings want to participate in a 15 km bike race, but the older two insist it's too long for young Mike. To gauge how long 15 km is, they ride around a field and then a zoo, then calculate the perimeter of each. On race day, will the distance be too much for poor little Mike? This Math Start series book would be helpful when teaching geometry lessons on perimeter. The story is engaging and certainly something to which the kids can relate (being told you are too young to do something and wanting to prove that wrong.) The perimeter math is made very clear in the three included examples. Our only concern: are children in the lower grades learning perimeter yet? Seems like the author/publisher's stated interest rate is pretty young. Below are sample spreads from inside Racing Around. In the first spread, the three siblings are discussing the upcoming bike race. In the second spread, Justin is shown riding around the perimeter of the athletic field and measuring all four sides of the field using the odometer on his bike. He is hoping that it will add up to 15 km--the length of the upcoming bike race. 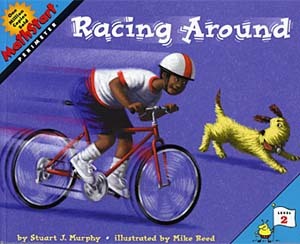 Stuart Murphy, the author of Racing Around, suggests that while reading this book to your class, teachers should "trace the perimeter around the athletic field, the zoo, and Perimeter Path using your fingers." Also, to increase engagement, have students find the perimeter by adding up the lengths of the sides. - "Using a ruler, help your students find the distance around familiar objects in the classroom, such as picture frames, tabletops, or computer screens. Make a drawing of each object and write the length of each side on the drawing. Then calculate the perimeter. - Use one of your students' favorite pictures and measure its perimeter. Using construction paper, make a frame for the picture and then measure the perimeter of the frame."